​Bird-like, bipedal sphenosuchian, with a beak-like mouth. Sphenosuchia. ​Termite-eating cynodont, converging on anteaters and echidnas. Chiniquodontidae novis. ​Large dicynodont with a rhinoceros-like horn. Kannemeyeriidae. ​Giant rauischian that converges on carnivorous dinosaurs in being an obligate biped, 9 meters long. Rauisuchidae. Stem-pterosaur with incipient flight adaptations. Ornithodira. 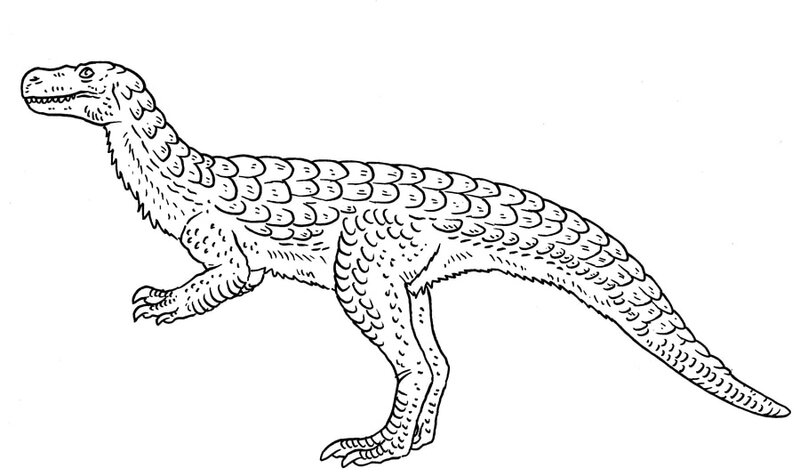 ​Relative of Chilesaurus, which is as long as 6 meters, with a covering of pangolin-like scales, derived from primitive feathers. Tetanurae. An ammonite which adheres to eachother in large clusters to form passively floating colonies. Kosmoceratidae. Ichthyosaur which is adapted to filter feed like a whale, using its teeth as a filter. Stenopterygiidae novis. ​Thyreophoran which is covered in large pointed spines, much like a porcupine. Basal Thyreophora. A carnivorous dinosaur which kills prey with sabre-like front teeth. Ceratosauridae. Venomous compsognathid coelurosaur, having channelled fang-like teeth. Compsognathidae. Theropod which has three bony crests instead of 2 or 1. Proceratosauridae. A repenomamus-like mammal which reaches the size of a large lynx. Gobiconodontidae. Appalachian tyrannosaur, which has large raptorial arms, and reaches up to 10 meters long. Tyrannosauroidea. Mosasaur which grubs in the mud for invertebrates using its sensitive lips, which contain mechanoreceptors. Halisaurinae. A primitive ceratopsian which is mainly carnivorous in its adaptations. Leptoceratopsidae. Medium-sized duckbill, which is adapted to a moose-like, water-plant eating lifestyle. Saurolophinae. Ceratopsian which has one large nose horn, and very little other ornamentation. Centrosaurinae. Hawk-like enantiornithe with large raptorial feet and claws. Avisauridae. Noasaur which spends much of its time underground, like a badger. Noasauridae.